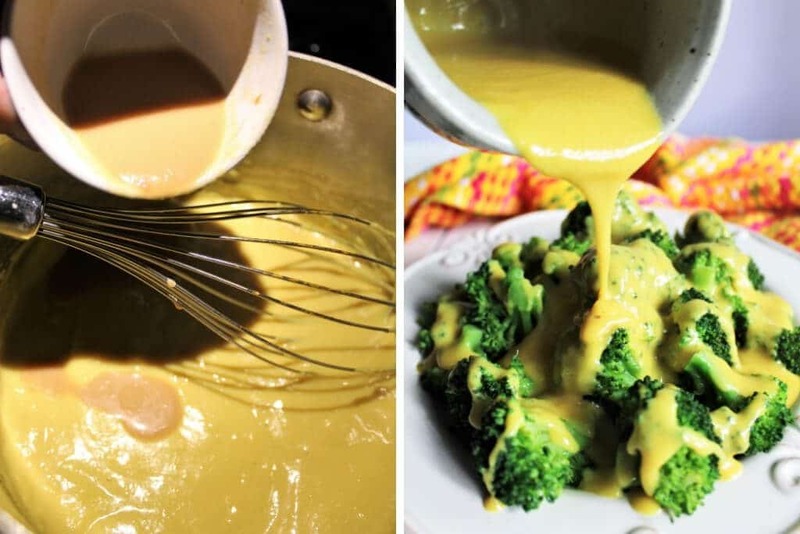 This is the ultimate vegan nacho cheese sauce! 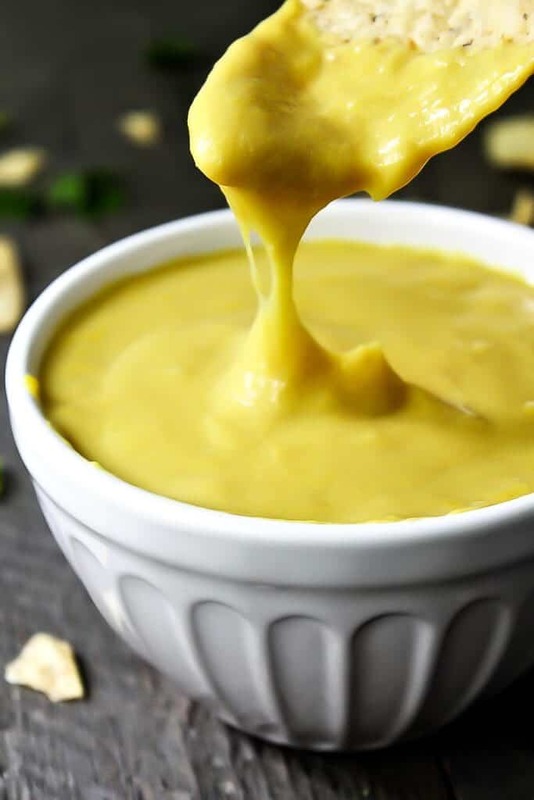 Quick and easy to make and free of dairy, oil, nuts, and gluten, yet this sauce has a creamy texture and the sharpness of real cheddar cheese! It’s easy and can be made in about 5 minutes! There are no nuts, oil or gluten, but it is still creamy and delicious! It can be made extra stretchy! 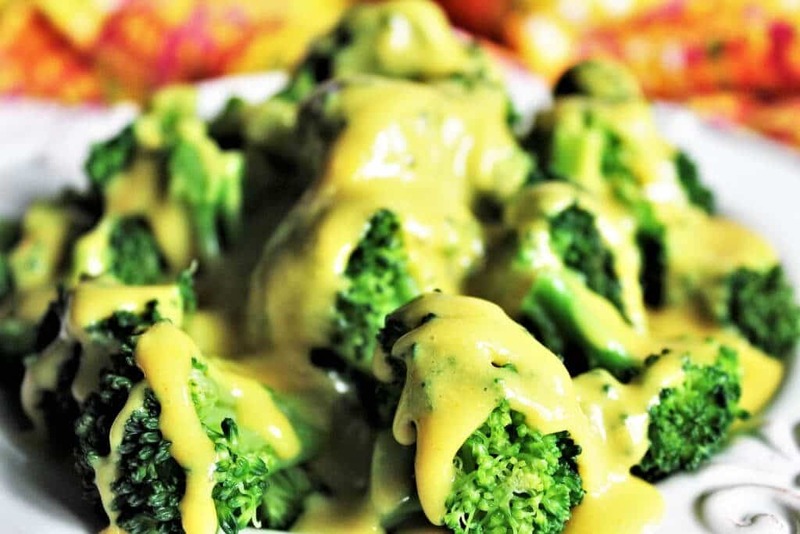 Kids LOVE it and will eat their veggies with cheese sauce poured over them! The closest tasting vegan nacho cheese to the real thing! It has a real cheddar cheese flavor! 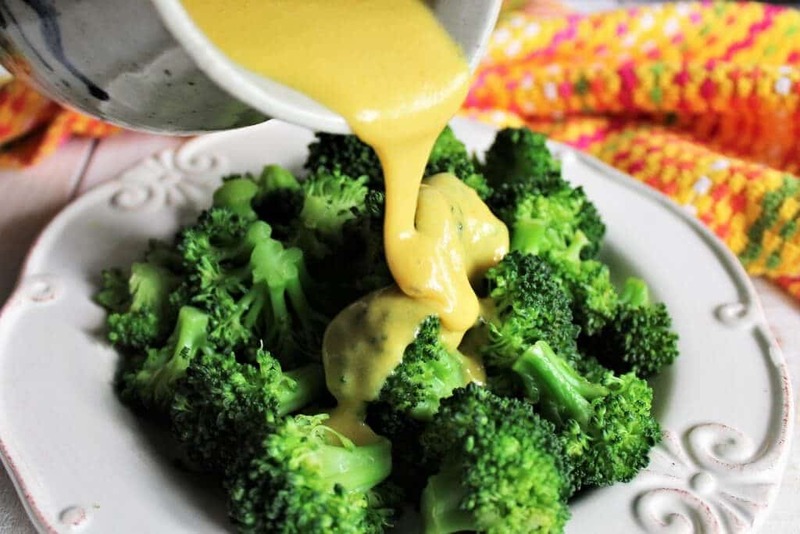 Nacho cheese sauce works great on broccoli, baked potatoes, and of course… nachos! 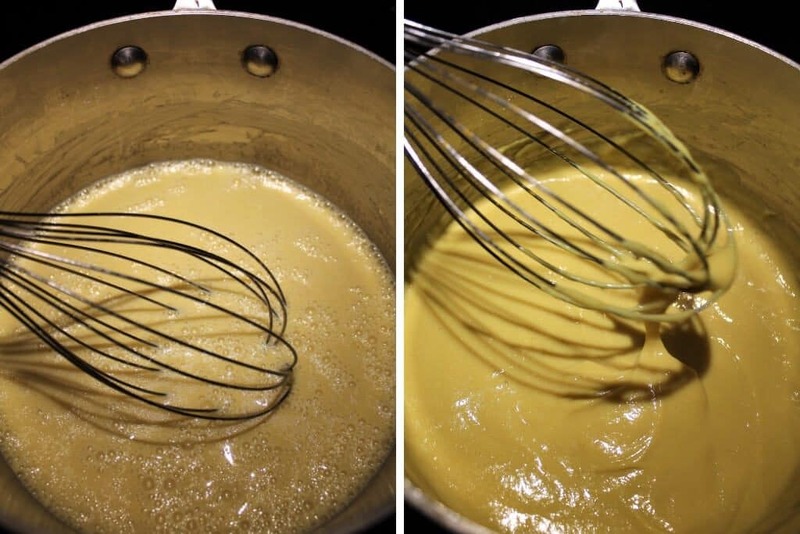 What can I do with this vegan nacho cheese sauce? Pour it over broccoli, cauliflower, or any veggies and watch them disappear! Use it to make loaded baked potatoes! 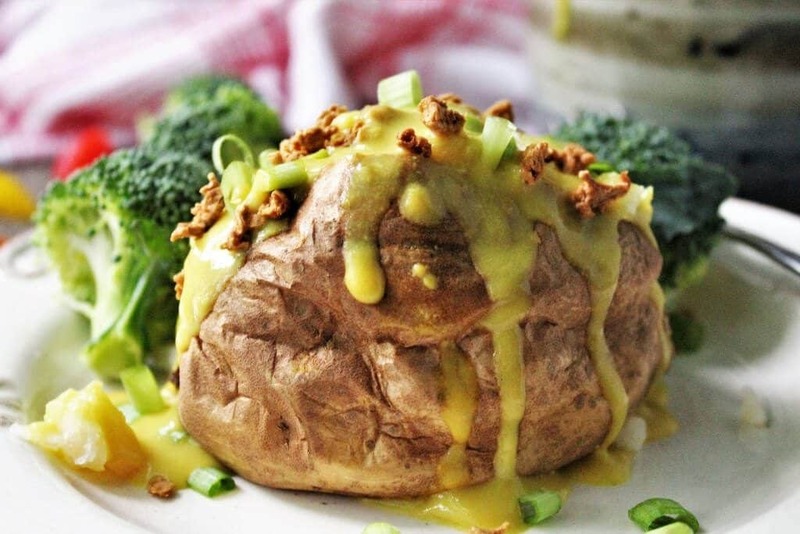 Topped with nacho cheese and homemade bacon bits you will have the ultimate vegan baked potato! Pour it over corn chips and make nachos! Add all of your favorite toppings for vegan nachos supreme! Make it thick and stretchy and use it as a vegan nacho cheese dip! How do I make a vegan nacho cheese sauce that stretches? It’s easy to make the sauce thicker and stretcher! Simply add an extra tablespoon of tapioca starch to the sauce while the milk is still cold. The tapioca starch thickens the sauce and gives it a stretchy texture. Note: You have to use tapioca starch! Nothing else gives it the same stretchy texture! 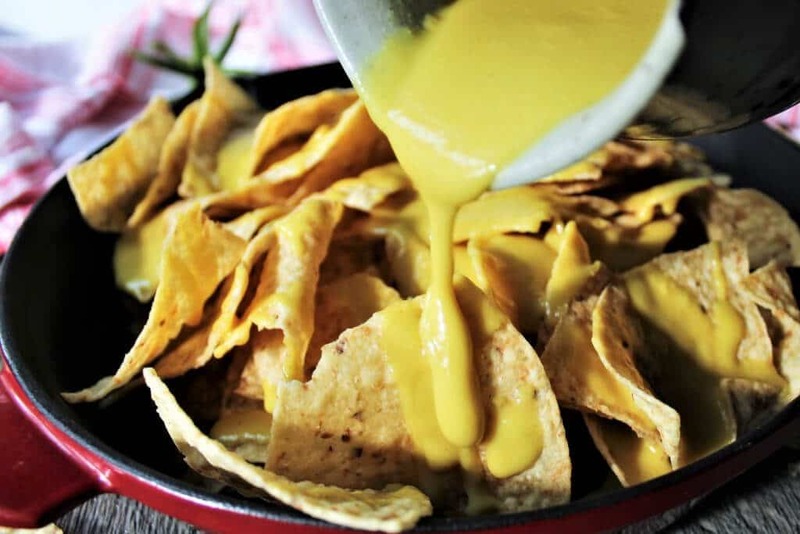 What is vegan nacho cheese made from and why? Soy milk – or any plant-based milk of choice – to make it creamy. Nutritional yeast – to give it that cheese umami flavor. Check out this link for more about nutritional yeast. Corn or potato starch – to thicken the sauce. Tapioca starch – to make it stretchy. Salt – for the saltiness of real cheese. Miso – to give it that cheddar cheese bite! How do you make a vegan cheese sauce? 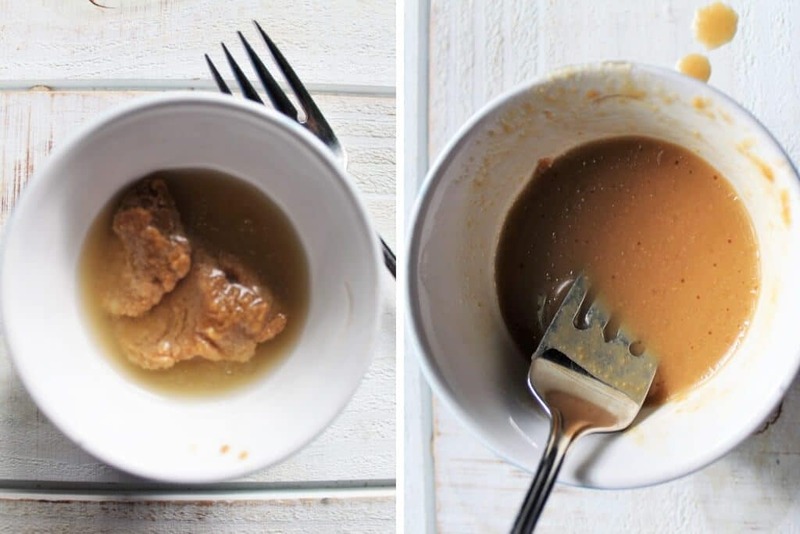 Mix together miso with a small amount of water and set aside. Add 1 ½ cups of COLD plant-based milk to a saucepan. Put in the starches, nutritional yeast, salt, and turmeric and stir well with a whisk. Turn on the heat to medium and stir constantly while heating. After a few minutes (once your sauce starts to boil) it will thicken very quickly. Allow it to boil for about 30 seconds and then remove from heat. Pour in your miso mixture and stir until smooth. Serve warm over broccoli, cauliflower, potatoes, or nachos! Make sure to add the starches while the milk is still cold and give it a good stir before turning on the heat! Stir very frequently and do not walk away from the stove! Your sauce with thicken very quickly once it reaches a certain temperature and if you are not stirring it at that time it will burn. Add the miso at the end of cooking after it has cool off for a minute as to not overheat the miso and reduce its beneficial probiotics. If you don’t use it all, it will keep in the fridge for up to 5 days in a sealed container. You can reheat the cheese sauce by adding a few teaspoons of water and reheating in the microwave or on the stove top. Love cheese? Want more vegan cheese recipes? Vegan Grilled Cheese with Cheese that Melts! Make sure to follow me on Instagram for daily inspiration and clickable links to my recipes! Add 1 ½ cups of cold plant base milk to a saucepan. Turn on the heat to medium and stir constantly while heating. After a few minutes (once your sauce starts to boil) it will thicken very quickly. Serve warm over broccoli, potatoes, or nachos! Add an additional tablespoon of tapioca starch to the cold milk and follow the rest of the instructions the same way. Tips for making great every time! If you don't use it all, it will keep in the fridge for up to 5 days in a sealed container. 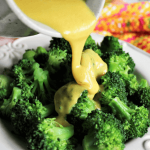 This is by far the best vegan cheese sauce I have made, and I have made many! It is a keeper. Thank you so much for sharing. This looks amazing! I miss cheese so much. I have a soy and mushroom allergy, is there an alternative that you can suggest for the miso paste? Thank you Monica, I didn’t know about the garbanzo bean miso, I’ll give it a try 🙂 all of your cheese recipes look delicious, I’m looking forward to them. I’ve tried a lot of the vegan cheese sauces, but this one is my favorite! I love the cheddar flavor that the miso gives it! It really tastes like real cheese sauce! Thanks so much for this recipe! Oh my gosh, this is DELICIOUS. I’m currently devouring it with tortilla chips, and I am going to be putting this stuff on everything!! I had a weird experience, though. I followed the recipe almost exactly (added about 1/2 tablespoon tapioca starch to make it just a bit thicker), and I had a lovely, thick, gooey sauce. As soon as I added the miso + water mixture, my sauce completely liquified. I salvaged it by adding another couple of tablespoons of tapioca starch mixed with a small amount of cold water and heating it back up to a boil to thicken, and that worked perfectly. I just can’t figure out why the tiny bit of miso and water completely liquified the whole thing! 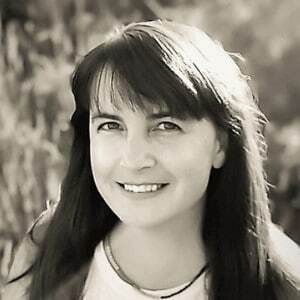 Hi Kathryn- I’m so happy that you liked it! It does thin out a bit once you add the miso. It comes out a nice thick consistency if you used 2 tbsp of tapioca starch even after you add the miso. Did you use corn starch too? Just make this last night! It was awesome! My kids loved it too!